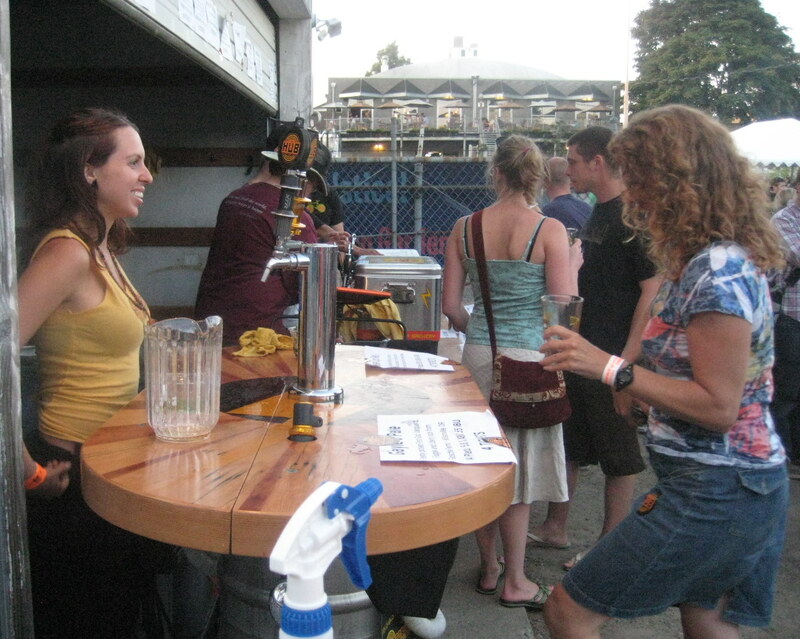 The second annual BikeToBeerFest held at Hopworks this past Saturday was a nice sequel to last year's festivities. If there were any doubts that this would continue to be a yearly event -- which there probably weren't -- I guess the good attendance and fine time had by all have put them to rest. They do seem to be feeling around for the correct date -- last year's was held in mid-September -- and I hope it stays in the pre-Labor Day range. BikeToBeerFest went off much like it did last year. It's a welcome sight to see two parking lots each filled with hundreds of bikes instead of a couple dozen cars, and to see the famous beer bike (pictured) in action. I don't remember the cost of getting in to last year's event, but I thought it was just the price of a glass and some tokens. This year there was a small $2 entry fee which was split as a donation to the Bicycle Transportation Alliance and Portland Sunday Parkways, both worthy recipients. Another difference was that this year you could get a 4-ounce sample for 1 ticket, whereas last year it was all pints. There were some perverse incentives at work there -- you could pay 6 tickets for almost a pint of strong beer, or 4 tickets for 4 quarter-pints. One thing that was the same was the fun live entertainment. 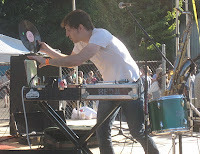 I was glad to catch Boy Eats Drum Machine's set -- his funky one-man-band antics stuck in my mind from last year's fest. All of that in addition to the Hopworks standards. I'm pretty tough to please with fresh-hop beers -- it has to knock me out with resinous freshness -- so Gayle's Pale was a little disappointing to me, though it was a fine enough pale ale. The Piledriver was a gem: the cherries were a welcome addition to an already decent Abbey Ale, and the brettanomyces seemed to dry it out nicely without making it one of these sour endurance tests. Portlandbeer.org has a nice writeup from Marcus and some of Matt's magnificent photos. I agree with you Bill. A great time and some great beers on tap. I like the first picture. It seems as though that water bottle is making sure that woman orders the correct beer or else it will attack! Jason: That's hilarious. I briefly noticed the spray bottle and resolved to crop it out but I guess I forgot. Now I guess I'll leave it in. Great to meet the little lady, put me on the email list for the big day.